In order to keep a pristine lawn, you are going to need to familiarize yourself with the most common types of weeds so you can know how to best get rid of them. Dandelions arrive in the springtime, and while they are an attractive flower, they take the phrase “growing like a weed” to a whole new level. They appear quickly, and reseed themselves so that you’ll have even more dandelions in years to come. Their roots go deep too—typically about ten inches into the ground. When uprooting these plants, it is important to ensure that you remove the entire root—even a fraction left behind will grow a new plant. So herbicides may be your best bet for this plant. Or you could work with the plant and harvest the dandelion greens for your cooking instead. 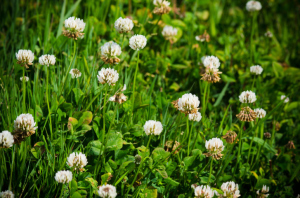 White clover (often called Dutch clover) is found in many lawns. It is identified by its clovers that grow with small white flowers. It is drawn to soil that is low in nitrogen, so applying fertilizer with high counts of nitrogen will help prevent them from growing back. You will need to apply fertilizer several times throughout the year to eradicate white clover. Crabgrass is easily recognized as those ugly spots of your lawn where the grass grows thick in a tight circle. Uproot the existing crabgrass, and then apply a pre-emergent herbicide that will help discourage any more from growing. 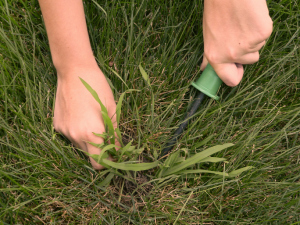 To prevent crabgrass from growing, avoid over-watering or over-fertilizing your lawn. The healthier your lawn, the less likely it will be for you to find crabgrass. Don’t trim your lawn too short, as this also encourages its growth. 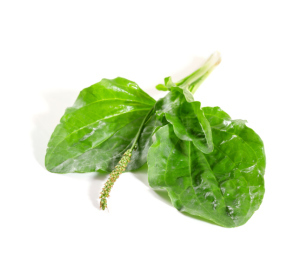 Broadleaf plantain (or greater plantain) grows in a rosette, with oval leaves and tall stems. To help prevent this weed, make sure to keep your soil aerated and fertilized. Since the seeds are easily spread, make sure to clean out your lawnmower and other tools in order to prevent the plants from spreading. To get rid of them, pull them out of the ground (roots included) before they have a chance to produce seeds. If they have already produced seeds, then a post-emergent herbicide will help you eradicate them. 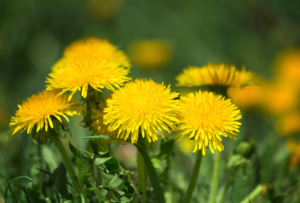 These are just a few of the most common types of weeds that are found in lawns. If you are having trouble combating all of the weeds in your lawn, or would like help maintaining a healthier lawn, please contact Greener Horizon. We are lawn care professionals that would be happy to help you with all of your lawn care needs.